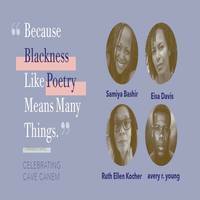 Four fellows from Cave Canem—one of the most influential poetry organizations in the world—offer an evening of new poetry and conversation. The program features reading from Samiya Bashir, Eisa Davis, Ruth Ellen Kocher, and avery r. young, while highlighting the work of this venerable institution. Founded in 1996 by poets Toi Derricotte and Cornelius Eady to “remedy the under-representation and isolation of African American poets in the literary landscape,”Cave Canem won the at the National Book Awards’ Literarian for Award for Outstanding Service to the American Literary Community in 2016. Ruth Ellen Kocher is the author of seven books of poetry, including Third Voice (Tupleo Press, 2016), Ending in Planes, winner of the Noemi Poetry Prize, Goodbye Lyric: The Gigans and Lovely Gun (The Sheep Meadow Press, 2014) and domina Un/blued (Tupelo Press 2013). Her poems have been translated into Persian in the Iranian literary magazine, She’r, and have appeared in various anthologies including: Angles of Ascent: A Norton Anthology of Contemporary African American Poets; Black Nature; From the Fishouse: An Anthology of Poems that Sing, Rhyme, Resound, Syncopate, Alliterate, and Just Plain Sound Great; and An Anthology for Creative Writers: The Garden of Forking Paths. She has received grants and fellowships from the National Endowment for the Arts, Yaddo, and Cave Canem. She is currently an Associate Dean for the College of Arts and Sciences at the University of Colorado at Boulder where she teaches Poetry, Poetics, and Literature in the undergraduate and MFA writing programs. avery r. young is a 3Arts Awardee and one of four executives for The Floating Museum. His poetry and prose are featured in several anthologies, including The Golden Shovel Anthology and The BreakBeat Poets. Most recently, his poetry is featured in photographer Cecil McDonald Jr.’s In The Company of Black (Candor Arts). He is the featured vocalist on flutist Nicole Mitchell’s Mandorla Awakening (FPE Records) and is currently touring with her Black Earth Ensemble and his funk/soul band de deacon board. Young’s first collection of visual and traditional poetry, neckbone (Northwestern University Press) will be released Spring 2019.